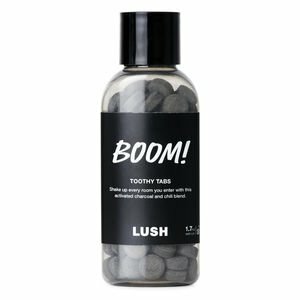 At the end of August, LUSH came out with new packaging for their Toothy Tabs. I was a little a disappointed at this because I liked the cardboard box and loved that the product did not come in plastic at all. Those small cardboard boxes were easy to compost. I realize the concerns a few had about 1) not getting enough tabs 2) the ease at which the cardboard box would get wet and ruin all of the tabs. I picked up the new product anyways to re-test. The Toothy Tabs now come in bottles made of 100% recycled plastic with the cap being a 5 Polypropylene (PP) and the bottle itself a 1 Polyethylene terephthalate (PET, PETE). Plastic #1 is the most common plastic to be recycled so that's a good sign. My husband likes LUSH Toothy Tabs the most and we've tried multiple natural toothpastes in the past. Since they now come in a larger bottle, there's a little bit more tabs now too. A dentist reviewed them and found them to be as effective. I also picked up the new product, LUSH Tooth Powder. See the full review below. ULTRABLAST: This one reminds me most of the old Colgates or Crests of the world. It is minty. It's supposed to have a hint of wasabi, but I don't taste it and I think that is a good sign. This is a powder. You just dip your toothbrush in it and start brushing. I guess if you crush the LUSH Toothy Tabs, you will get this powder form. This foams a little bit better than the other natural toothpaste. Not sure how I feel yet thought about sharing the tub with others as they would be dipping their toothbrush into the powder. Since it's also in powder form, you won't have any issues with TSA when traveling. Packaged in #5 PP plastic so it can be recycled. I believe you may be able to bring these into the store and have them reuse and recycle it, but I don't have final confirmation on that yet. I know they do it for the black pots. Around $11 pot. Definitely expensive, but it's made with natural, organic, vegan ingredients. LUSH has stores around the world and online. I bought mine at the mall. Sidebar: it's been a while since I've been in an actual mall and had a little anxiety going into it. I am not sure how it is shipped and delivered. Another buy for me and my husband. Mainly for my husband. This gets the job done while having less artificial chemicals. Though I am getting use to it. Just need to make sure I have a good supply as there are not a lot of LUSH stores around us.